This, the Lovecraft volume of Books at Brown, contains “expanded versions of papers given by participants in the H.P. Lovecraft Centennial Conference that was held at Brown University on August 17–19, 1990.” Also included in this volume are a series of letters written by Lovecraft to John T. Dunn, co-founder of the Providence Amateur Press Club. Dunn, who was “fanatically pro-Irish” and, therefore, anti-British, refused to respond to the draft in World War I and was subsequently court-martialed. Although he served a number of years in the Atlanta Federal Prison, he was released soon after the war and spent most of the rest of his life as a priest in the Catholic Church. These letters not only shed light on Lovecraft’s attitudes regarding World War I, but on his involvement in amateur journalism. 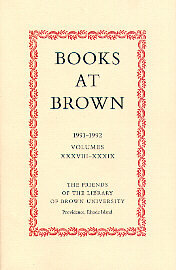 Please see the Books at Brown web page for more information on purchasing a printed copy of this issue. An electronic copy may be downloaded at no cost from The Brown Digital Repository.